Download Free Large Business Icons here. This is a package of a free collection consisting of neat icons that can be used especially for websites and software that has some relevance to business. 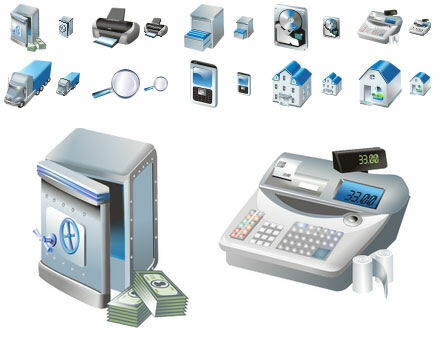 Free Large Business Icons includes pictures that represent different topics within the subject of business. Examples of this are icons such of a safe, a printer, a hard drive, a cash register, a truck and so on. All of the icons are available with shadows and they actually look very professional even though they're free to use. This is the perfect solution for upstarts that don't have too much money to spend on design and graphics. The icons are available in the following formats: 16x16, 24x24, 32x32, 48x48, 256x256, and 512x512 pixels. They are furthermore divided into both 256 colors and True Color with semi-transparency. They are saved in GIF, BMP, PNG and ICO. Find Free Large Business Icons, mark it and choose "Uninstall"
Should Free Large Business Icons has been damaged or corrupted and thereby difficult to remove we can recommend you finding help to uninstall it here.